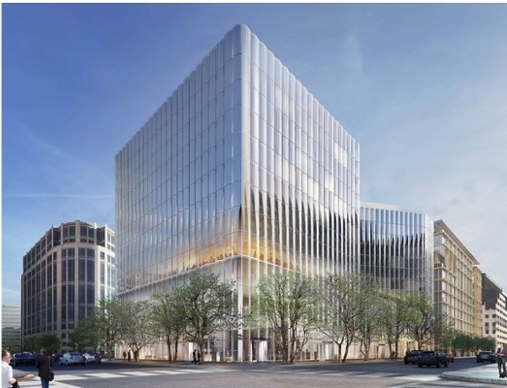 Hines Interests LP and their CityCenter DC development partners, will be bringing a Hilton-branded Conrad Hotel to one of the two remaining properties at their 10 acre CityCenter DC site. BDC has been a member of this team since 2000. Construction is scheduled to begin on the hotel in mid-2015.The 370-room luxury hotel will include 70,000 square feet of “large-format retail, scheduled to open in the fall of 2017 and the hotel in early 2018. This will be the first Washington, D.C., hotel under the Conrad Hotel moniker from Hilton (NYSE: HLT), whose name comes from the original founder of the hotel company, Conrad Hilton. The luxury hotel fits with CityCenter DC’s upscale residences and retail offerings, and will cater to the luxury business traveler. The Conrad Washington, D.C. will be designed by Swiss firm Herzog & de MeuronArchitekten. The interior design will be done by Rottet Studio.